thanks for hosting again! My favorite place to be on Monday's! I totally agree about the cold! I'm dreaming of a WARM Christmas! I have to work too, but I have something fun to do too! Wonderful questions. I enjoyed reading your answers. 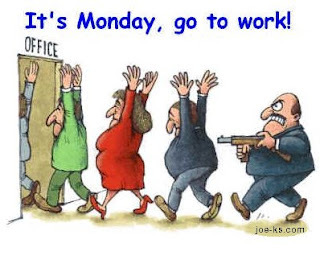 I bet you're really looking froward to your 2 weeks off! Don't work to hard tomorrow. I agree with you. I prefer warm weather and totally understand #1. Same mommy routine :) but I do get to see the sun! Hi, I'm a new participant this week . 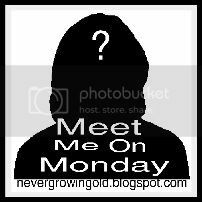 I just posted in my blog today "Meet Me on Monday" because I have yet to figure out how to link up the post and not my whole blog. Oh mercy! The first time I play and I managed to grab the wrong list of questions. If that doesn't totally write a billboard for my life I don't know what does. *sigh*. Oh well... I did the work and I'm gonna leave them. Maybe next week I will manage to be on track with everyone else. We've had a few days of cold and now we're getting back to warmer days...that's the way it is in the South..
What would you be doing today if you didn't have to go to work? I would not blame you for not finding Shaun Cassidy not cute :)And the reading part, I'm glad I'm not alone in finding time to do one. I missed the fun just curling up comfortably in my reading nook and lost to my own world! Thanks for hosting again this week!! I may have seen Sean Cassidy before the concert I listed but it was at the State Fair, so maybe thats not quite the same thing. I also loved him, I used to change the words to Da Do Ron Ron to "Meet HIM on a Monday and my heart stood still" ;) Have a great week. 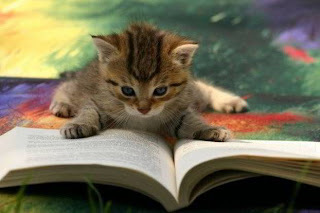 I have taken an extended hiatis but am trying to get back to bloggin. I kind of go for jello. I like eating something that reducing back to liquid with a little swishing. I love your picture to the first question, "Tomorrow I am going to... That is cute. I work from home so I don't have to leave my house, but I understand the feeling! 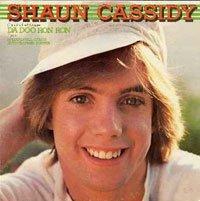 thank you for the fun hop ;) I am so jealous about seeing Shaun Cassidy Oh he was such a heart throb in the day.